Is there a product I can apply to the the brown spots to remove them and restore the grass? Fungicides are available for Brown Patch treatment on Buffalo lawns, and should be used if cultural management methods do not control the disease on their own. Remember the golden rule of lawn fungicides - they are only ever to be used in conjunction with proper lawn care practices (cultural management practices). The lawn must remain strong to help fight fungal diseases in conjunction with the fungicide. 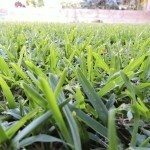 And unless proper lawn care practices are put into place, the Buffalo lawn will remain highly susceptible to ongoing infections of Brown Patch and all other lawn diseases.